Spend two nights at a picturesque campsite in Dharamshala, with the mountains around you and the stars above. This package includes some fun adventure activities like rappelling, zip line, hikes, rifle shooting, ropes course, and archery, so you'll have plenty to keep you busy. In the evenings, you'll enjoy a bonfire and some light music. NOTE: You need to have a minimum of 5 adults to make this booking. This campsite is located in a small village called Mohal Tou, close to Dharamshala and McLeodganj. At a height of 5000 feet, it offers spectacular views of the surrounding Dhauladhar range and the Kangra valley. You can ramble down forest trails, explore the Indru Nag temple, or go for short treks. You'll be camping in spacious Swiss tents equipped with beds, and all bedding. There are common washrooms, separate for men and women. Around the campsite, you can try the many activities, as well as archery, rifle shooting, stream walking, or trek to a nearby tea garden. • Spend two nights in the lap of nature at this cosy campsite near Dharamshala. • Soak in the scenic views of snowy peaks from the campsite. 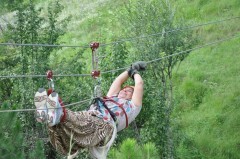 • Try your hand at rappelling, zip line, rope course, and many other fun activities. • Enjoy a tent stay, eat delicious meals, and fall asleep with the sounds of nature outside. This Dharamshala camping trip is a non-strenuous activity, however, if you have asthma, heart conditions, spine or knee problems, please consult your personal physician before any activities. There will be no refunds for unused facilities. Carrying illegal substances or drugs is not permitted on this Dharamshala camping trip. Participants must adhere to the instructions of the guide at all times. For cancellations of this Dharamshala camping trip made 7 days or more before check-in: Full refund will be given, minus any transaction charges. For cancellations of this Dharamshala camping trip made 4-6 days or more before check-in: 50% refund will be given, minus any transaction charges. For cancellations of this Dharamshala camping trip made 0-3 days before check-in: No refund. The operator can cancel or reschedule the Dharamshala camping trip due to unforeseen weather conditions. The operator is not responsible for any accidents, mishaps, death or injury during the Dharamshala camping trip. Participants are responsible for their own belongings and the operator will not be liable for any loss or damage during the Dharamshala camping trip. Costs for children: Complimentary stay and food for 0-6 years; 50% off for children aged 7-12 years. Above 12 years will be charged adult rates. There is no pick-up for this Dharamshala camping trip. There is no drop-off for this Dharamshala camping trip. Arrive at the campsite by noon. You'll check into your comfortable Swiss tents, freshen up, and eat lunch. After that, you can try rifle shooting or archery, or just relax. In the evening, you can go for a short walk. End the day with hot soup around a bonfire, and eat a delicious dinner before retiring to your comfortable tents. You'll wake up and can decide how you want to spend the day. There are many adventure activities to keep you busy, and some scenic short treks in the area too. You'll enjoy a full day in the fresh air, and end with a bonfire and some light music. After soup and dinner, you'll retire to your tents for the night. You'll wake up to a scenic morning and make the most of the early hours with some yoga or a morning walk. You'll eat a filling breakfast and after this, you'll pack up and check out from the campsite.Your trip ends here. Personal expenses like extra meals, packaged water, soft drinks, telephone calls, etc. You can check in by noon. You'll be shown to your comfortable twin-sharing Swiss tents at the campsite. Each tent has beds, all bedding, and charging points. You'll be served lunch, evening tea and snacks, soup, and dinner today. In the evening, there's a bonfire and light music for you to enjoy. The campsite is equipped with common washrooms, separate for men and women, with facilities like hot water and Western toilet. In the morning, you'll be served tea, and then will eat a hearty breakfast. After that, there's lots of adventure activities to try. In the evening, the bonfire beckons. You'll retire to your tents for the night. Enjoy a day of fun activities. In the morning, you'll be served tea and breakfast. After that, it's time to check out. Your trip ends here. Your campsite is about 30 minutes from Dharamshala. You can take an overnight bus from Delhi to Dharamshala and then take local transport to the campsite. You can also drive down if you have your own vehicle.